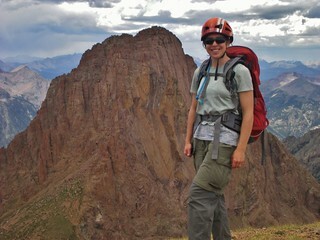 After bagging both Pigeon and Turret, we were all ready to hike out of Ruby Basin and back to civilization. We woke up rather early and broke camp. 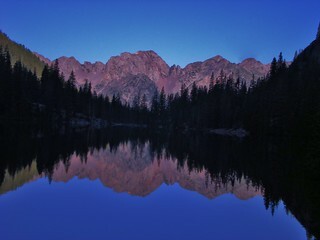 On our way hiking out, I got this amazing picture of Ruby Lake at 8am. 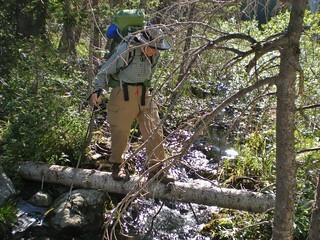 We crossed a couple of streams on our way back to Needleton Station. Here’s Georgia traversing a log. 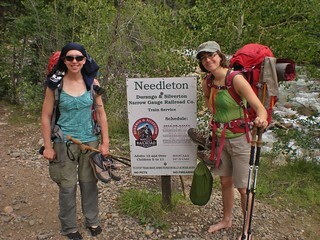 At Needleton Station, after descending for about 5 hours from Ruby Basin high meadow base camp. Our Centennial Celebration Climb for the CMC 100 year anniversary was a resounding success! 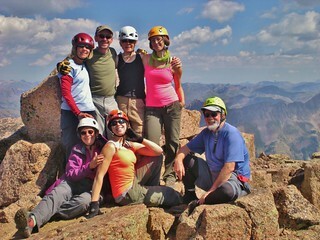 Here we are soaking in the sun on the summit of Pigeon Peak (13,972 ft). Back: Nancy, Jeff, Georgia, and Erin (Leader In Training!). The San Juan mountains are so remote my cell phone was confused and thought we were in the Pacific Time Zone. As a result, my phone did not sound the alarm at 3:30am. We were supposed to leave base camp at 4am and instead Erin and I were dozing in sweet slumber. Finally, my team decided they had waited long enough and (thankfully) came to wake us up. At 4:10, Erin and I jumped to action. We got dressed and grabbed some food and suddenly we were vertical…and moving forward. Since I was the trip leader, this was a particularly bad way to start summit day. 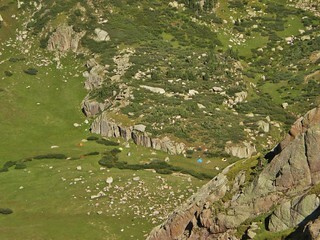 On Friday morning, we broke camp and hiked to the huge football field sized meadow at the base of Pigeon and Turret Peaks. The rain from the previous day had soaked everything. It was time for the morning shake and shove…First ya gotta shake it out, then you gotta shove it in the pack. We all made breakfast and talked excitedly about the day ahead of us. 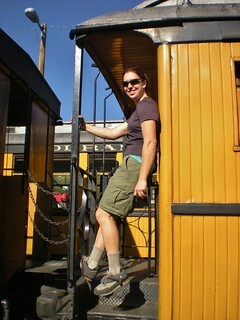 Clare the Trip Leader Ensuring All Aboard! 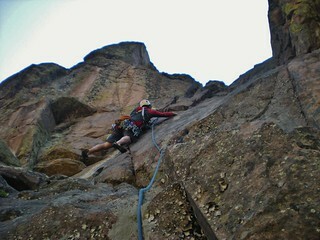 As part of the CMC Centennial Celebration, I led a trip into Ruby Lake basin to climb Pigeon and Turret Peaks. 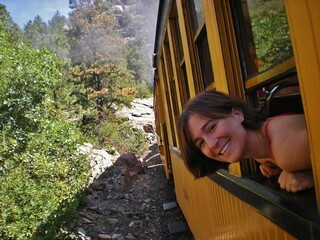 Most people access these reclusive peaks by riding the Durango and Silverton narrow gauge train to the Needleton station which is the trailhead for Chicago Basin, Needle Creek Drainage, Ruby Lake Basin, and Noname Creek. I was very excited to be taking Linda & Tom, Georgia, Jeffrey, Steve, Nancy, and Erin into this secluded and remote location. 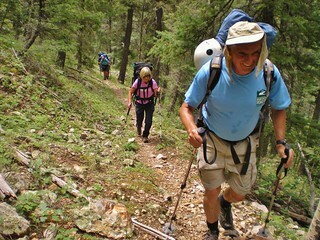 Steve was coming from the East Coast, but had spent several weeks in Estes Park acclimatizing. Jeffrey was coming from Telluride and participated in one of my trail runs as preparation. Erin had been hiking and climbing with me all summer. 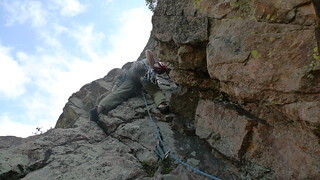 Everybody else had participated in the Tenmile Peak trip, so I knew we had what it takes to do the climb. The question was, would we prevail with weather and route finding? You are currently browsing the climbergirl blog blog archives for August, 2012.